MARKETS please check each website to confirm time and date. March 14, April 11 May 9th 3-7 pm. 50 local vendors from North East Florida offering fresh fruits and vegetables, local honey breads, home made bakery goods, cream lotions, arts and crafts. *St. Johns River Farmer’s Market on facebook. Mandarin Farmers Market - Every Sunday from 12noon to 4pm. Located in the parking lot of Whole Foods Market. 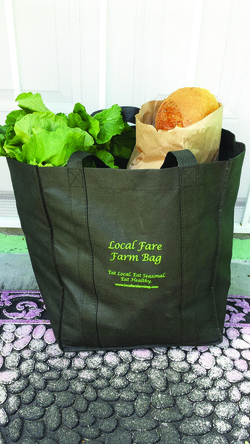 Lincolnville Farmer's Market -Every Sunday from Noon to 4:00 p.m.
Owners of Local Fare Farm Bag, Cora & Chris Curry are passionate about food. Chris was an Executive Chef in Savannah, Georgia and his restaurant had its own organic garden so when he moved here he was disappointed at the lack of whole foods available and wanted to do something about it. They landed on the idea of delivering bags of local produce, meats, eggs, breads and honey to homes. It is similar to a CSA but the Curry’s do no not own a farm. They simply gather the food for the bags and then deliver it to your doorstep. It is an excellent way for families to get local food without the time-consuming aspect of going to the farm to pick up your share. They are particular about which farms and other providers, using only the best available. For instance, they invited me to tag along for a visit to St. Johns Family Farm where they get fresh eggs (see pictures of the farm on this page). They recently introduced meat to the Farm Bag as well. Chris and Cora dream of one day opening a grocery that provides only local foods. The Curry’s describe thier business: Seasonal, locally sourced produce delivered straight to your home or office weekly. Includes a variety of vegetables, fruits, herbs and a hand crafted loaf of bread. We also send a weekly newsletter with your subscription that tells you what is going on in the world of agriculture and gives you recipes using the ingredients that are included in your delivery. Our delivery areas include Jacksonville, Ponte Vedra, Orange Park, Middleburg, Fleming Island, St Johns, Atlantic Beach, Neptune Beach, Oakleaf & more! Old school farming is making a comeback here in North East St Johns County. Just ask Dawn Hutchins a local food blogger with Florida Coast cooking. “As a food blogger in the local area I have had the pleasure of working with Vivian and Francisco the owners of KYV Farm. They grow everything from broccoli and potatoes to arugula and rutabaga - good ole turnip. They don’t use chemical pesticides or fertilizers, using crop rotation, companion cropping, green manure which uses the uprooted dying plants in soil to increase nutrient levels. KYV farms also manages the Berry stack Hydroponic u-pick Farm seen from I-95. Vistors can pick berries and access the whole farm. KYV is a community supported Farm. One rainy day I visited this live working farm where chickens, goats and ducks live in a clean, comfortable environment. The farm, which sits way back in the wild area just off Roberts Road, is owned by Manny and Yvonne Granados whose approach is to use humane, traditional and sustainable methods. The chickens here have freedom to roam around the aviary and chemicals are not used to clean the outer layer off the eggs, so the nutrition remains high. Lucky for residents of northern St. Johns the farm has a roadside stand we can visit in the afternoon. If you do not have time to visit you can get these fresh eggs in your local Fare Farm Bag!! 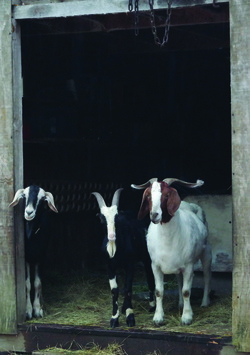 Manny & Yvonne’s philosophy: Utilizing only humane and sustainable methods. We don’t think that bigger and standardized is better. Small, local food production with complete transparency for the customer is the solution to questions of food safety and environmental protection. Black Hog Farm owner Sharon Watkins sharon@blackhogfarm.com is a new kid on the block. They are growing in popularity as they do doorstep delivery. Black Hog provides fresh meat products delicious and no nonsense ingredients. The Fresh Farm movement is making headway as more locally grwon food is transcending to consumers making its way to your kitchen table and local restaurants.